High attenuation in the lungs is not infrequently encountered on computed tomography (CT). 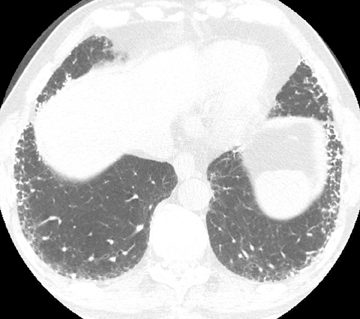 Not all significantly radiopaque lung findings are calcified. Iodine (a halogen) as well as a variety of metals besides calcium cause high attenuation. 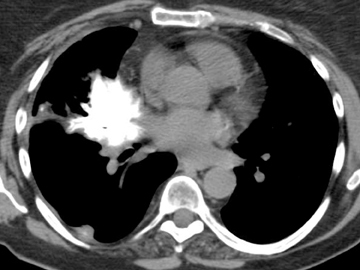 Pulmonary calcification may occur in two ways: dystrophic and metastatic. The former denotes calcium deposition in damaged tissue (caseation, necrosis, fibrosis) despite normocalcemia. 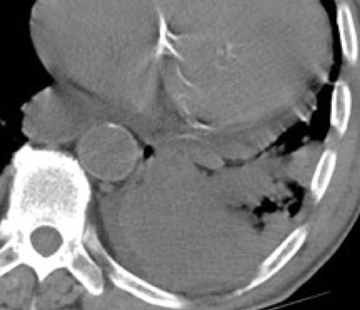 Metastatic calcification is defined later. High attenuation is recognizable on soft-tissue windows, but is easily missed if only lung windows are assessed. The finding may be striking on maximum intensity projection (MIP) images, if available. The literature offers assorted definitions for high attenuation; for example, visually opaque as bone or > 200 HU.1,2 No single definition applies in every instance. In practice, however, these criteria may be useful in equivocal cases. Images processed with high-spatial-frequency reconstruction algorithms for lung analysis may cause the false appearance of high attenuation, such as in tiny pulmonary nodules. This predisposes to the premature conclusion of benignity. Therefore, we suggest that any suspicion of high attenuation be confirmed on standard algorithm images. While in many cases the presence of high attenuation is ancillary and not required for diagnosis, it can be helpful in the imaging interpretation of some entities (eg, amiodarone). 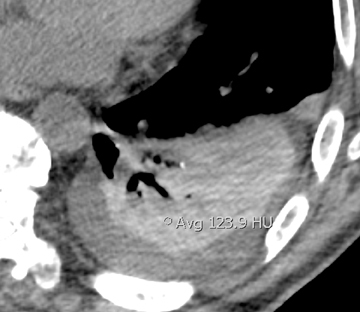 Mindful of the audience, we try to cover the gamut of high attenuation specifically within the lungs on CT, using intentional brevity and emphasizing features that lend themselves to a diagnosis. An airway or vascular process is discernible on cross-sectional imaging, whether purely by localization or by the presence of a tubular or branching process. Airway processes may obstruct, causing any combination of mucus plugging, bronchial dilation or bronchiectasis, airway-centric opacities, atelectasis, consolidation, and air trapping. Decreased perfusion due to hypoxic vasoconstriction or due to increased pressures from air trapping is possible. In vascular processes, decreased perfusion suggests oligemia or intrinsic vascular pathology. With respect to high attenuation alone, the presence of eccentric or stippled calcifications within an airway-associated lesion should trigger further investigation, as these patterns of calcification are indeterminate for malignancy. On the other hand, popcorn calcification is essentially diagnostic of a hamartoma and would preclude unnecessary workup. Ideally, distal airway and airway-centric high-attenuating opacities are demonstrated in the setting of oral contrast aspiration (Figure 1). Uniform high attenuation makes infection unlikely. When confluent, the diagnosis becomes challenging and relies more heavily on the sequence of events relative to oral contrast administration as well as on history (eg, CNS disorder). Ancillary findings of aspiration may include chemical pneumonitis and secondary pneumonia.5 Aspiration of elemental mercury is considered in the appropriate setting. In asthmatics, moderate-to-severe central bronchiectasis affecting 3 or more lobes, bronchial wall thickening, mucoid impaction, and centrilobular lung nodules are suggestive of allergic bronchopulmonary aspergillosis (ABPA) (Figure 2).6 The same features are less useful in poorly controlled cystic fibrosis. High-attenuating mucus relative to normal skeletal muscle adds specificity to the diagnosis in asthmatics and may be the finding that elicits the diagnosis in cystic fibrosis. The higher density is attributed to inspissation of mucus and deposition of calcium salts and metals.7 Of note, persistent mucus plugging in general may calcify. Extensive or diffuse tracheobronchial high attenuation (eg, warfarin therapy, relapsing polychondritis) will not be discussed. Upon contacting circulating blood through accidental or intentional administration, elemental mercury becomes spherical owing to interface tension. This is unlike iodinated contrast, which readily intermixes with blood. Mercury embolizes to dependent locations within lung due to its higher density than water. The droplets may coalesce and become tubular within vessels. The diagnosis is based on pure high-attenuating material in a generally symmetric and bilateral vascular distribution, arborized, if extensive, and supported by the presence of droplets in the right side of the heart or in other vascular beds. If fortuitous, images will show subcutaneous deposits in the injected extremity.13 History and clinical findings secure the diagnosis. 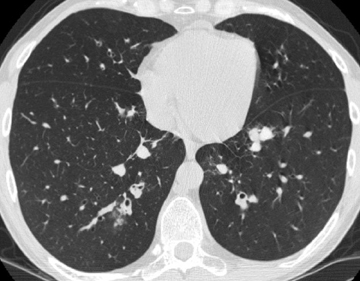 The workup of a solitary pulmonary nodule has been well described in the literature, with diagnosis/management depending on nodule characteristics, stability, and risk factors for malignancy.16,17 With exceptions, diffuse, central, lamellar, and popcorn type calcifications are indicative of benign etiologies, while stippled and eccentric patterns are indeterminate. The most common causes of solitary pulmonary nodules are hamartomas, granulomas, and malignancy. As above, the diagnosis of a hamartoma (or even multiple hamartomas) is made simple by the infrequent occurrence of popcorn calcification. With evidence of chronic pulmonary venous hypertension, a distinctively lower-lung-predominant distribution of high-attenuating nodules (reported anywhere from 1-8 mm in size) is highly suggestive of diffuse pulmonary ossification, nodular type (Figure 7). 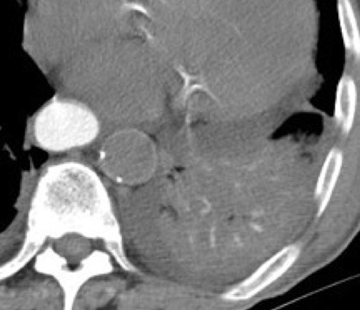 The nodules may be misinterpreted as calcified granulomas. The classic example of diffuse pulmonary ossification is chronic mitral stenosis. 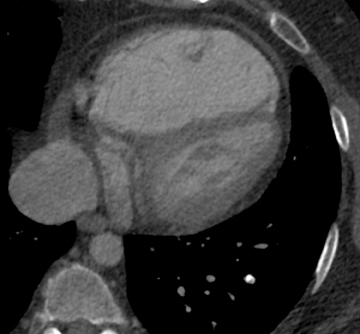 In the case of rheumatic heart disease, findings often comprise a calcified mitral valve, an enlarged left atrium with or without atrial wall calcifications, and pulmonary hypertension. 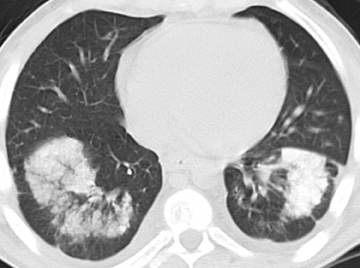 Bilateral mid- to upper-lung predominant < 5 mm perilymphatic nodules with or without mass-like conglomeration in both upper lungs elicits a differential of inorganic dust exposure and sarcoidosis (Figure 11). Added calcification or ossification contributes little to the diagnosis, although it is exceedingly rare in sarcoid lung nodules.25 Silicosis and coal workers’ pneumoconiosis are largely indistinguishable despite slight differences in nodule margins and calcification pattern. Berylliosis and pulmonary sarcoidosis mimic one another on imaging and pathology and have more of a tendency for interstitial thickening. Unilateral mass-like consolidation should prompt consideration for malignancy.34 Egg-shell calcifications make berylliosis unlikely. Amiodarone and iodinated oil embolism are in the differential of single or multiple high-attenuating areas of consolidation without associated lung nodules (Figure 12). Amiodarone is typically peripheral. The iodine moieties of the antiarrhythmic drug are responsible for the high attenuation, ranging from 82-174 HU according to one series. The presence of interstitial opacities or fibrosis would favor amiodarone, as would a high-attenuating liver or spleen (90-110 HU). Amiodarone toxicity versus simple lung accumulation cannot be differentiated on imaging alone.1,43 The diagnosis of iodinated oil embolism relies on knowledge of prior lymphangiography or transcatheter oil chemoembolization.12 In either case, history is integral to the diagnosis. Finally, certain metallic opacities cause significant streak artifact and may require scout tomography and clinical history for elucidation (eg, bullets, fiducial markers). High attenuation in the lungs is more than calcification. Acknowledging this adds complexity to its interpretation. At times, its presence is a welcome clue to otherwise nonspecific lung opacities. In many cases, however, the diagnosis will remain uncertain. Nevertheless, we hope this article leads to more confident interpretation. Chai JL, Patz EF Jr. CT of the lung: Patterns of calcification and other high-attenuation abnormalities. AJR Am J Roentgenol. 1994;162:1063-1066. Khan AN, Al-Jahdali HH, Allen CM, et al. The calcified lung nodule: What does it mean? Ann Thorac Med. 2010;5:67-79. 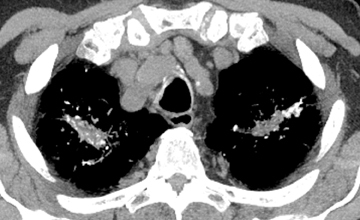 Conces DJ Jr, Tarver RD, Vix VA. Broncholithiasis: CT features in 15 patients. AJR Am J Roentgenol. 1991;157:249-253. Seo JB, Song KS, Lee JS, et al. Broncholithiasis: Review of the causes with radiologic-pathologic correlation. Radiographics. 2002;22 Spec No:S199-213. Franquet T, Giménez A, Rosón N, et al. Aspiration diseases: Findings, pitfalls, and differential diagnosis. Radiographics. 2000;20:673-685. Ward S, Heyneman L, Lee MJ, et al. Accuracy of CT in the diagnosis of allergic bronchopulmonary aspergillosis in asthmatic patients. AJR Am J Roentgenol. 1999;173:937-942. Agarwal R. High attenuation mucoid impaction in allergic bronchopulmonary aspergillosis. World J Radiol. 2010;2:41-43. Chan ED, Morales DV, Welsh CH, et al. 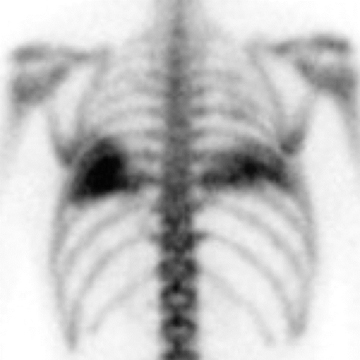 Calcium deposition with or without bone formation in the lung. Am J Respir Crit Care Med. 2002;165:1654-1669. Castañer E, Gallardo X, Ballesteros E, et al. 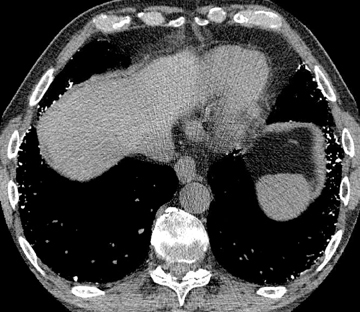 CT diagnosis of chronic pulmonary thromboembolism. Radiographics. 2009;29:31-50. Kanne JP, Gotway MB, Thoongsuwan N, et al. 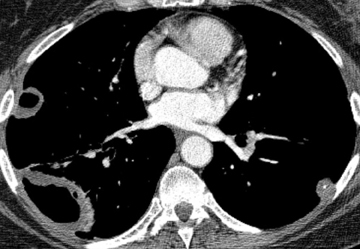 Six cases of acute central pulmonary embolism revealed on unenhanced multidetector CT of the chest. AJR Am J Roentgenol. 2003;180:1661-1664. Hamrick-Turner J, Abbitt PL, Harrison RB, et al. Diffuse lung calcifications following fat emboli and adult respiratory distress syndromes: CT findings. J Thorac Imaging. 1994;9:47-50. Marchiori E, Souza AS Jr, Franquet T, et al. Diffuse high-attenuation pulmonary abnormalities: A pattern-oriented diagnostic approach on high-resolution CT. AJR Am J Roentgenol. 2005;184:273-282. Sichletidis L, Moustakas I, Chloros D, et al. Scattered micronodular high density lung opacities due to mercury embolism. Eur Radiol. 2004;14:2146-2147. Rossi SE, Goodman PC, Franquet T. Nonthrombotic pulmonary emboli. AJR Am J Roentgenol. 2000;174:1499-1508. Yi CA, Lee KS, Choe YH, et al. 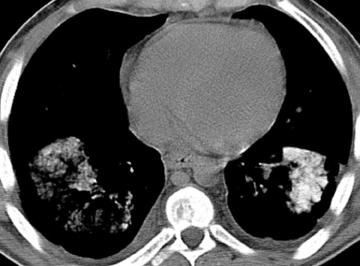 Computed tomography in pulmonary artery sarcoma: Distinguishing features from pulmonary embolic disease. J Comput Assist Tomogr. 2004;28:34-39. Winer-Muram HT. The solitary pulmonary nodule. Radiology. 2006;239:34-49. Tan BB, Flaherty KR, Kazerooni EA, et al. The solitary pulmonary nodule. Chest. 2003;123(Suppl):89S-96S. Slanetz PJ, Whitman GJ, Shepard JA, et al. Nodular pulmonary amyloidosis. AJR Am J Roentgenol. 1994;163:296. Georgiades CS, Neyman EG, Barish MA, et al. Amyloidosis: Review and CT manifestations. Radiographics. 2004;24:405-416. Kobayashi H, Matsuoka R, Kitamura S, et al. Sjögren’s syndrome with multiple bullae and pulmonary nodular amyloidosis. Chest. 1988;94:438-440. Jeong YJ, Lee KS, Chung MP, et al. Amyloidosis and lymphoproliferative disease in Sjögren syndrome: Thin-section computed tomography findings and histopathologic comparisons. J Comput Assist Tomogr. 2004;28:776-781. Seo JB, Im JG, Goo JM, et al. Atypical pulmonary metastases: Spectrum of radiologic findings. Radiographics. 2001;21:403-417. Chalaoui J, Grégoire P, Sylvestre J, et al. Pulmonary hyalinizing granuloma: A cause of pulmonary nodules. Radiology. 1984;152:23-26. Srinivas S, Dhelaria R, Pai D, et al. 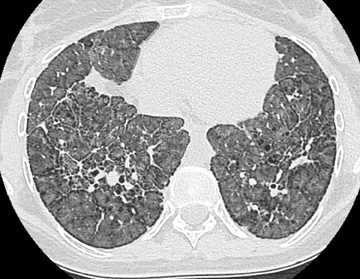 Multiple calcified pulmonary nodules: An unusual presentation of rheumatoid lung. Clin Radiol. 2007;62:274-276. Brown K, Mund DF, Aberle DR, et al. 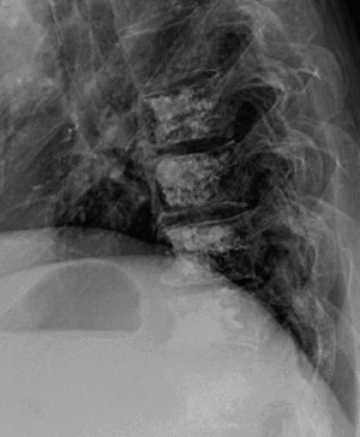 Intrathoracic calcifications: radiographic features and differential diagnoses. Radiographics. 1994;14:1247-1261. Srivatsa SS, Burger CD, Douglas WW. Upper lobe pulmonary parenchymal calcification in a patient with AIDS and Pneumocystis carinii pneumonia receiving aerosolized pentamidine. Chest. 1992;101:266-267. Felson B, Schwarz J, Lukin RR, et al. Idiopathic pulmonary ossification. Radiology. 1984;153:303-310. Fried ED, Godwin TA. Extensive diffuse pulmonary ossification. Chest. 1992;102:1614-1615. Woolley K, Stark P. Pulmonary parenchymal manifestations of mitral valve disease. Radiographics. 1999;19:965-972. Gevenois PA, Abehsera M, Knoop C, et al. Disseminated pulmonary ossification in end-stage pulmonary fibrosis: CT demonstration. AJR Am J Roentgenol. 1994;162:1303-1304. Levy J, Wilmott RW. Pulmonary hemosiderosis. Pediatr Pulmonol. 1986;2:384-391. Hartman TE, Müller NL, Primack SL, et al. 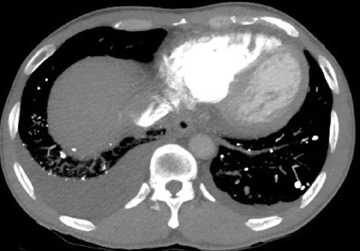 Metastatic pulmonary calcification in patients with hypercalcemia: Findings on chest radiographs and CT scans. AJR Am J Roentgenol. 1994;162:799-802. Marchiori E, Franquet T, Gasparetto TD, et al. Consolidation with diffuse or focal high attenuation: Computed tomography findings. J Thorac Imaging. 2008;23:298-304. Chong S, Lee KS, Chung MJ, et al. Pneumoconiosis: comparison of imaging and pathologic findings. Radiographics. 2006;26:59-77. Graham CM, Stern EJ, Finkbeiner WE, et al. 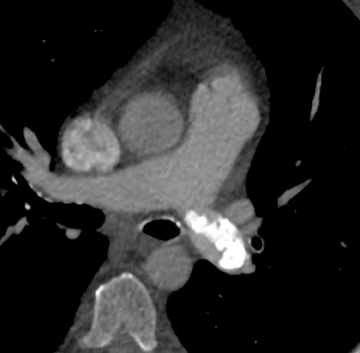 High-resolution CT appearance of diffuse alveolar septal amyloidosis. AJR Am J Roentgenol. 1992;158:265-267. Ohdama S, Akagawa S, Matsubara O, et al. Primary diffuse alveolar septal amyloidosis with multiple cysts and calcification. Eur Respir J. 1996;9:1569-1571. Ward S, Heyneman LE, Reittner P, et al. Talcosis associated with IV abuse of oral medications: CT findings. AJR Am J Roentgenol. 2000;174:789-793. Akira M, Kozuka T, Yamamoto S, et al. Inhalational talc pneumoconiosis: radiographic and CT findings in 14 patients. AJR Am J Roentgenol. 2007;188:326-333. Bendeck SE, Leung AN, Berry GJ, et al. 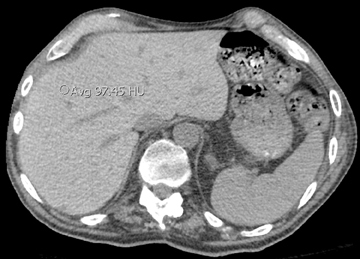 Cellulose granulomatosis presenting as centrilobular nodules: CT and histologic findings. AJR Am J Roentgenol. 2001;177:1151-1153. Marchiori E, Gonçalves CM, Escuissato DL, et al. Pulmonary alveolar microlithiasis: High-resolution computed tomography findings in 10 patients. J Bras Pneumol. 2007 Oct;33:552-557. Gasparetto EL, Tazoniero P, Escuissato DL, et al. Pulmonary alveolar microlithiasis presenting with crazy-paving pattern on high resolution CT. Br J Radiol. 2004;77:974-976. Tachibana T, Hagiwara K, Johkoh T. Pulmonary alveolar microlithiasis: Review and management. Curr Opin Pulm Med. 2009;15:486-490. Kuhlman JE, Teigen C, Ren H, et al. 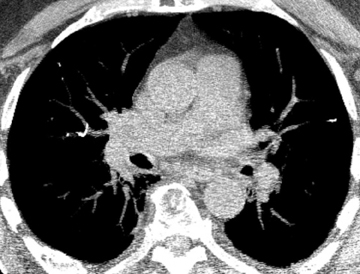 Amiodarone pulmonary toxicity: CT findings in symptomatic patients. Radiology. 1990;177:121-125. Yüksel M, Akgül AG, Evman S, et al. Suture and stapler granulomas: A word of caution. Eur J Cardiothorac Surg. 2007;31:563-565. High attenuation in the lungs on CT: Beyond calcified granulomas. Appl Radiol.